The Hospitality industry is growing at a tremendous rate. Even the competition is becoming more fierce. Marketing is thus decisive in terms of giving a competitive advantage to hospitality organisations. This article focuses on the most trusted marketing tools in the hospitality industry. In this post, we have covered five broad categories of marketing tools to help your hospitality business shine. While we have kept this article simple, we have ensured that there are enough advanced resources as well to help the marketing strategists out there. Top Marketing strategies for the hospitality industry ride on these tools. We will first discuss the broad categories and then try to subdivide the categories further. Put simply, if your hospitality organisation doesn’t have a website, it doesn’t exist. If your organisation doesn’t have an eye-catching and attention-grabbing website, you are losing big on potential business. Plus, not having a decent website, dents your chances to become a brand in the hospitality industry. Thus, we have started with the website while listing the top marketing tools in the hospitality industry. If you have already built a website then, it’s probably the time to refresh the design for better conversion. Have a look at a few of the Stunning Hotel Website designs for inspiration. After you have made a website and ensured that it is a quality one, you would want your audience to know more about your business. Hotels and other hospitality organisations work a lot on word of mouth publicity. Content helps you send clear messages across your target segment. Plus, you build an organic presence across the globe. Content marketing is becoming a clear winner these days as far as top marketing tools in the hospitality segment is concerned. Content is equally effective in social media and e-mail marketing. NetAffinity in one of its articles on Hotel Marketing tools has organised few of the great resources to help build content, to do keyword research, to create better digital presence and more. Use Evernote, Quora, Canva, Keywordtool, Buzzsumo and other tools to organise content ideas, create content and then promote them effectively. Social media marketing today is one of the most important ways to promote your business. A lot say that the social media space is stacked as of now. Competition is fierce but so are the opportunities. If Hospitality businesses are to thrive, they would have to depend heavily on social media promotion and e-mail marketing. If you don’t believe us check out the Social media research summary for 2018 by SmartInsights. The sheer volume indicates how important digital marketing strategy is to the hospitality and travel industry which pretty much targets the globe as the audience. One of our earlier posts suggests 10 social media tips for hotels that might be useful for further study on this subject. Similar is the story with e-mail marketing. E-mail marketing can give you a big marketing boost. Here are a few points to prove that e-mail marketing can be one of the most trusted marketing tools in the hospitality industry. Social media might be stacked but there are still a lot of marketing tools relevant to the hospitality industry which can be used free of cost. Use these to promote your hospitality business and get ahead of the competition. 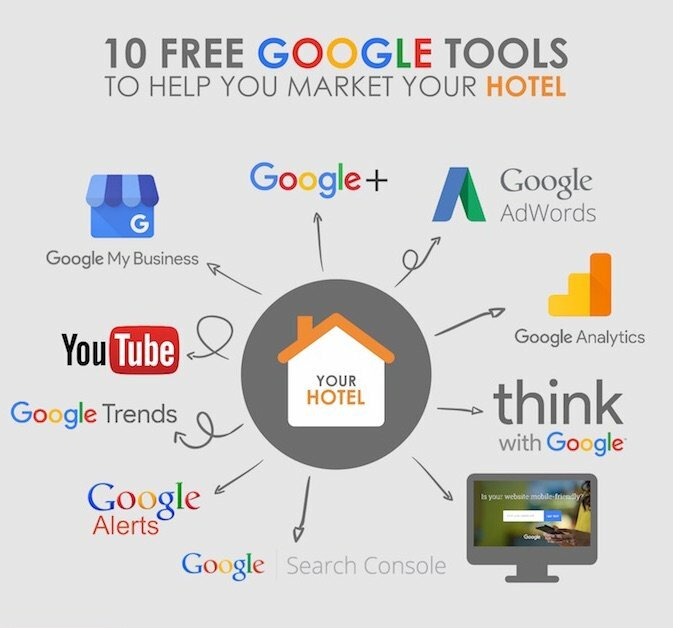 Here you can find 10 Free Google tools for marketing your hospitality business. While the above marketing tools explained how digital platforms can help skyrocket your hospitality business, one can’t undermine conventional wisdom. The Hospitality industry is more about face to face interaction and word of mouth publicity. Here’s where the printed advertisement and events come in handy. It helps you get an uninterrupted attention. The attention span is extremely less on the digital platforms. Events can thus be big winners. If you were wondering about the popularity of the Food & Beverage Shows around the world, you now know why. A lot of the best Hospitality magazines are full of advertisements both for their online as well as printed formats. The response rate and conversion are still high while the competition is driving the cost of these marketing tools down. Try organising and event to showcase how your hotel or restaurant is way better than the competition. You might make a lot of customers for a lifetime when you meet them in person. The list of marketing tools in the hospitality industry might sound overwhelming. So many tools. Which one to select and which one to discard? A lot of Hotel Management Software help automate a lot of things for the hospitality businesses. These include distribution systems, property management systems and more. But, did you know that a lot of hospitality marketing tools can also be automated? Right from social media marketing, to customer reach out to content promotion. A lot of these can be automated by using the right tools. There are a lot of providers of these automation services who can help improve the profitability of your hospitality business by few button clicks. Google them out and get the best fit for your organisation. Most of these would have free trials before you are forced to shell out a sum of money. So, try them out and retain the one that fits your need and budget. Customer acquisition and retention are two of the key hospitality Marketing Strategies. The whole aim of marketing is to acquire the customer and then retain as well as upsell. There are a lot of marketing tools in the hospitality industry that can help in this whole process. 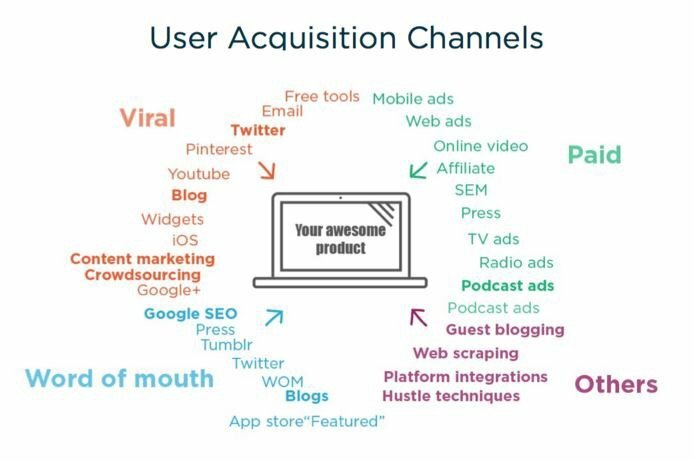 To acquire customers, you have to create a proper portfolio or a mix to ensure you reach out to the right people and grab their attention. So, let’s sum up the ones mentioned in this article and few others through this image by an article published on Medium. So, try out these to check which work the best and create an excellent portfolio. Some initial workout and research are well worth the effort given the lifetime benefits you can expect to reap out of the effort. Now comes the terms of customer retention. The Hospitality industry is already quite good at it through various Customer loyalty programmes. Don’t forget other tools like VIP clubs, Passes, Vouchers etc. However, a little bit of innovation and some use of technology can help provide an unparalleled user experience and a better retention rate. Artificial Intelligence (AI) solves much of the puzzle stored in the minds of customers. The hospitality industry is already testing a lot of AI-related tools and we have already covered a lot of them on this portal. Technology today is coming up like a quick fix solution to everything. However, we must not ignore the conventional wisdom as we stressed in this post. 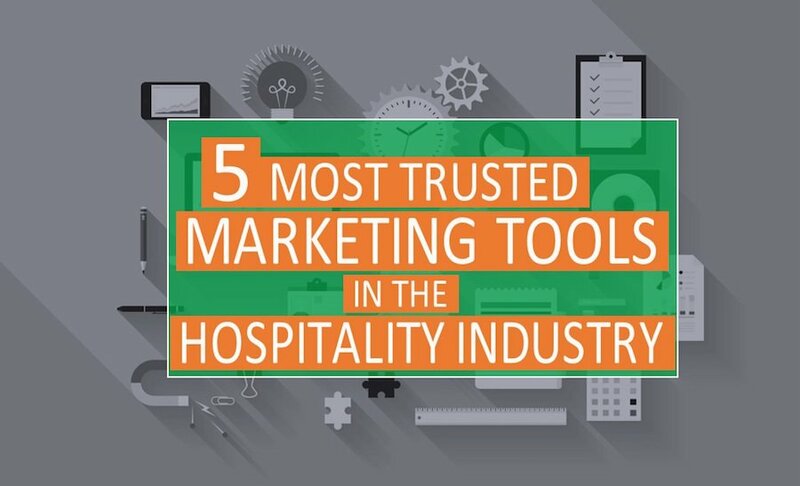 We covered a few of the most trusted marketing tools in the hospitality industry. Hopefully, we will be of some help in helping your hospitality business shine a bit more. Check out another extensive guide of 58 marketing tools in an article on Hubspot. 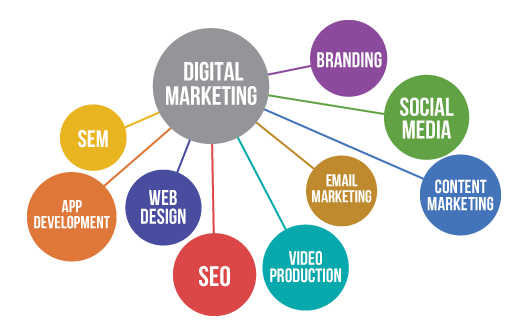 Get the best out the digital marketing channel. The image is a good recap of what you should be considering. However, also remember that Old is Gold. Nothing would beat a personal interaction in the hospitality industry. The events, telesales and leaflets can be offbeat for other industries but they continue wielding magic in our very own hospitality world.